The Solar Powered Gate Opener from SolarTronics now enables users to remotely open the gate in the rain or at night, without getting out of their vehicle. After passing through the gate it then automatically closes and locks with a positive locking system using a locking shaft and a locking bracket that cannot be pushed open, providing maximum security. The Drive Unit is a heavy duty, 24volt swing arm mechanism that provides long life, reliability and fast gate opening/closing time typically 12 to 13 seconds . The system comes with 2 batteries to provide additional open/closes to cover extended periods of little or no sunshine. This amount of battery power will provide in excess of 400 openings/closings without charging, on a normal farm gate. The gate opener is available as Solar Powered that requires no electrical power at the gate, or 240volt which does require power to be cabled to the gate. Both systems have battery backup when there is no sunlight (for solar) or loss of electrical power such as a blackout (for 240volt). Visitor buttons can be added to the gate system which allows for visitors that do not have a remote control transmitter. These visitor buttons can be hard wired back to the control box, or wireless pushbuttons which do not require cabling (no trenches to be dug). For security, a wireless keypad can be installed which requires a PIN number to gain entry. 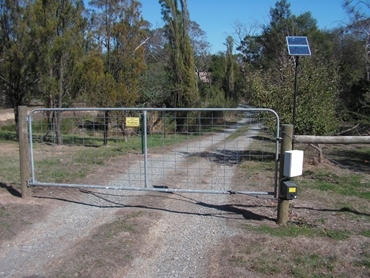 Additional options can be included like photo electric sensors to stop the gate closing on slower vehicles such as large trucks or farm machinery, in ground vehicle loops to open the gate when a vehicle drives over the loop, remote controlled gate lock so that all visitor entry buttons can be disabled from your vehicle as you leave the property or retire at night. Other options also include remote controls to control your gate from up to 3km. or alarms to warn the gate is opening up to 2km. away. The gate controller kits come as an easy to install DIY kit.